Sanyo Electric Co. Ltd. has recently announced a new high-end IH rice cooker series which will be available in commercial market by September 2007. Featured with high thermal conductive pure copper (with purity of 99.9%) layered between stainless steel and aluminum alloy, it is said to be able to transfer heat quickly while able to cook delicious rice as compared to traditional rice cooker. Besides the quality of material, the company also implements a patented variable pressure boiling method which is able to boil the rice evenly throughout the whole cooking process. By changing the boiling pressure between 1 and 1.2 atm alternatively, it can make the rice “dance” and stream even more throughly. Furthermore, it is equipped with “flavor circulation unit” in the lid that able to soak the flavor all over into the rice without wasting it to the air. 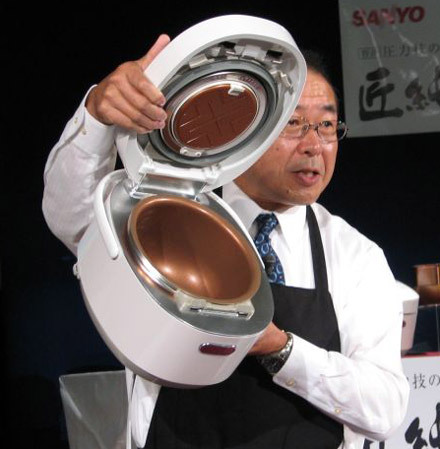 The high-end IH rice cooker is quite pricey (twice as expensive as compared to its predecessor) at a retail price of 131, 250 Yen (USD1,076) that may not be affordable by all households. However, for those that really emphasize on quality home cooked rice, it may be worthy to get one for your lovely family. Two of the new high-end series that are going to be released are ECJ-XP10 and ECJ-V10. The available colors are white/black and champagne gold respectively.